I can remember clearly the first time I took Dave for sushi. He was not brave enough to be alone with me eating raw fish, and so joined me with two of our friends in tow. The one actually asked the waitress how he was supposed to cook his fish! Dave swallowed the sashimi, and it took 10 years before he braved another piece. Now, he eats sushi and sashimi with relish, and sears the tuna like he is an old hand at eating raw fish. 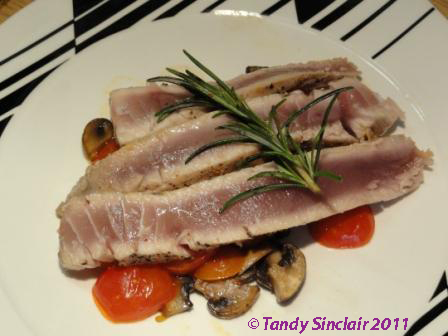 In my opinion there is no other way to eat tuna – if you get it fresh, eat it raw but if it has been frozen you need to sear it. Defrost the tuna in the fridge for 24 hours, allow it to come up to room temperature before making this seared, and do not make the pan too hot. Will get to blogging about it soon I hope! I have never heard of deep friend sushi! Nice to have you back in the blogosphere.